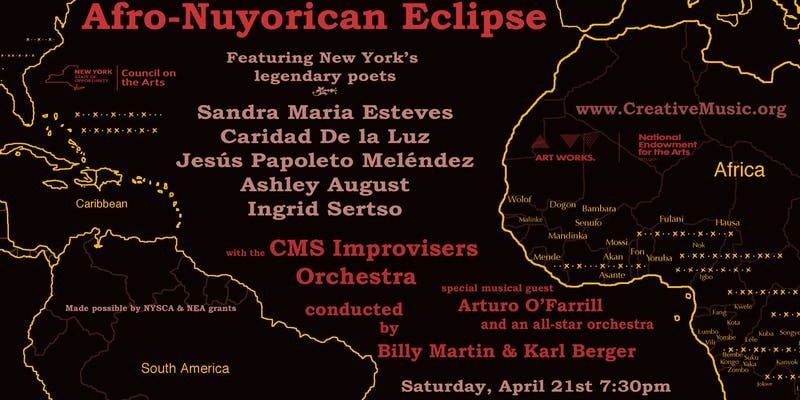 Legendary Nuyorican artists collaborate live with the CMS Improvisers Orchestra at El Taller featuring Sandra Maria Esteves, Jésus Papoleto Meléndez, Calidad De la Luz, Ashley August, Ingrid Sertso, Arturo O’Farrill, and Frank London. On Saturday evening 7:30pm April 21st 2018, Creative Music Studio (CMS) will celebrate two important American artistic movements at El Taller Latino Americano on 99th St. in East Harlem. Legendary poets and performers Sandra Maria Esteves, Jésus Papoleto Meléndez, Calidad De la Luz, Ingrid Sertso and Ashley August will be accompanied by the CMS Improvisers Orchestra, a collective all-star cast of musicians from the NY Downtown experimental movement, upstate NY and elsewhere that explore all musical languages including jazz, world and classical. The CMS Improvisers Orchestra under the direction of Billy Martin and Karl Berger will include an all-star orchestra featuring Jane Scarpantoni, Kenny Wolleson, Ingrid Laubrock, Ken Filiano, Sylvain Leroux, Frank London, Steven Bernstein, Arturo O’Farrill and more. Tickets for this event will be available to purchase in advance for $15 at www.CreativeMusic.org or $20 day-of-show, downstairs in the El Taller building. La Peña del Inmigrante de las Americas. Juan Falú and Friends.